Late last week, November 30, YouTuber turned pop artist Poppy claimed that she had been "bullied" by Grimes after the pair recorded a song together. Grimes has now responded, stating that she feels "punished" and describing their collaboration as a "disgusting situation." The pair worked together on "Play Destroy," which features on Poppy's second album, released in October. Speaking to Billboard Poppy alleged the song's release was delayed for "months" by Grimes and her team, who Poppy claims "bullied [her] into submission." 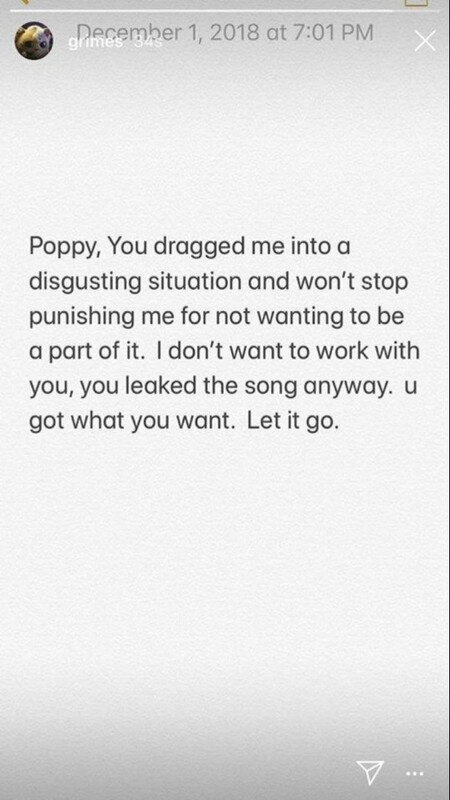 On December 1 Grimes responded via Instagram Stories, writing: "Poppy, you dragged me into a disgusting situation and won’t stop punishing me for not wanting to be a part of it. I don’t want to work with you, you leaked the song anyway. u got what you want. Let it go." The FADER has reached out to reps for Grimes and Poppy. Last week Grimes returned with her own new music, sharing "We Appreciate Power."